(Nanowerk News) During the normal grinding of powders in a mortar, the powders can enter into chemical reactions with each other. This phenomenon has been known for years but only now it has become possible to transform in this way three-dimensional clusters of certain chemical compounds into other, also three-dimensional, clusters. The spectacularly easy reaction was conducted by scientists from the Institute of Physical Chemistry of the Polish Academy of Sciences and the Faculty of Chemistry of Warsaw University of Technology. The discovery was brought about by the development of a new method of creation of unique compounds that are precursors of nano zinc oxide – a material used, in particular, in modern electronics. In scientific laboratories and industrial plants nearly all chemical reactions take place in liquids, but a group of scientists from the Institute of Physical Chemistry of the Polish Academy of Sciences (IPC PAS) and the Faculty of Chemistry of Warsaw University of Technology (FC WUT) managed to produce an interesting chemical compound through the reaction which was conducted in a solid only. During the research it was also discovered that the grinding of the new compound, even in an ordinary mortar, led to the creation of cubic molecular structures. "This last result is particularly astonishing," comments Prof. Janusz Lewinski (IPC PAS, FC WUT). The grinding of powders in a mortar can result in chemical reactions during which regular three-dimensional molecular structures are formed. 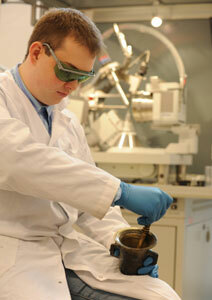 In the photo is Michal Dutkiewicz, a graduate student from the Faculty of Chemistry of Warsaw University of Technology. "By using simple mechanochemical methods we managed to change one complicated three-dimensional molecular structure into another, also three-dimensional, and, what is most interesting, surprisingly regular structure. This is the first mechanochemical reaction of this type in the world". The discovery was described in an article published in a prestigious chemical journal Angewandte Chemie ("Solid-State Conversion of the Solvated Dimer into a Long Overlooked Trimeric Species"). Mechanochemistry consists in running chemical reactions in solids, which in practice comes down to grinding powders. Chemists knew that trituration was important for a long time, but it was supposed that the reason was the change in the proportion between the surface and the volume in lumps of the substance grinded. However, at the end of the previous century crystallographers noticed that grinding also caused changes in the structure of organic compounds. This is possible because these compounds form crystal structures with weak non-covalent bonds. During the trituration the bonds break and new chemical compounds are created. "Mechanochemical reactions run very quickly and in the entire volume of powders. If we put, for instance, two white powders in appropriate proportions in a mortar or a shaker, after just several dozens of minutes we can pour out yellow powder which will be a new clean chemical compound," explains a PhD student Daniel Prochowicz (FC WUT). Since during the grinding of biologically active compounds new crystal structures – polymorphic varieties that may be patented – are obtained, pharmaceutical industry has become strongly interested in mechanochemistry in recent years. A starting point for the reactions discovered by the Polish scientists was a compound containing complexes of zinc oxide ZnO, in which atoms of zinc are bound weakly by molecules of a solvent. At the temperature of 35°C the compound was subjected to lowered pressure. This caused desolvation, that is the molecules of the solvent separated from metal complexes. X-ray analysis revealed that an alkyl-alkoxy zinc compound was created as a result, with a unique complex spatial structure which cannot be obtained by any other method. Since the substance produced by the Polish scientists is a precursor of zinc oxide, it can be used to produce this semi-conductor commonly used in electronics. What is more, thanks to the unique spatial structure of the compound, nanoparticles of zinc oxide obtained from that compound have slightly different properties than ZnO nanoparticles produced with the use of other methods, and consequently, they can have new applications in various types of nanotechnologies. The compound created during desolvation turned out to be a trimer, which means that each of its molecules comprises three basic units – mers. These mers form a surprisingly complex and asymmetric spatial structure. The new compound of zinc, in the form of powder, was grinded manually in a mortar. On the basis of X-ray analysis of the substance obtained as a result of grinding it was possible to state that it was not a trimer anymore but a tetramer with a very regular, cubic crystal structure. The result was a considerable surprise for the researchers. Earlier mechanochemical transformations with the use of complex compounds either changed the structure of the complex or resulted in the creation of a coordination polymer, that is a one-dimensional metal-metal chain connected by organic links. "We managed for the first time to cause a mechanochemical transformation of a cluster into another cluster, that is to go from one three-dimensional structure to another one," says a student Michal Dutkiewicz (FC WUT). The physicochemical mechanism responsible for this astonishing transformation remains unknown. The discoveries of Polish scientists open the way to the synthesis of new groups of alkoxy compounds that are precursors of oxide compounds. This type of compounds is widely used, in particular in electronics and material chemistry, including many nanotechnologies.